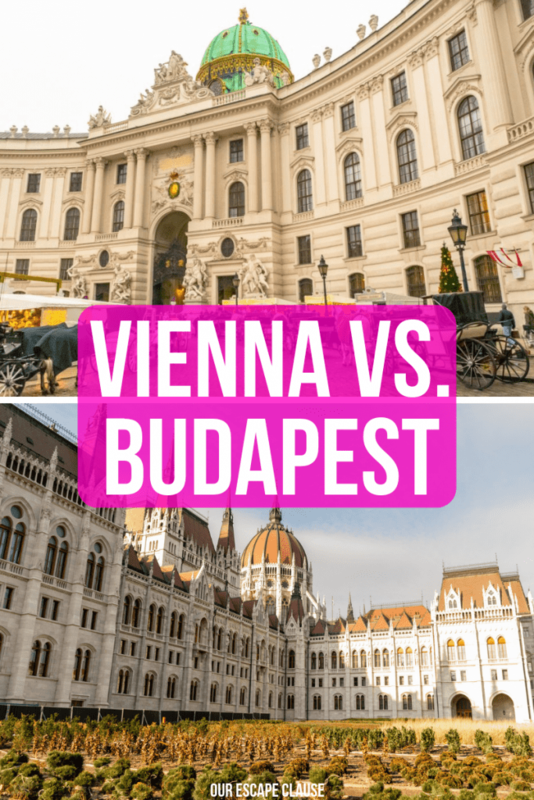 Budapest or Vienna: thanks to their close proximity to each other and several other interesting destinations in Central Europe, these two cities tend to be regularly compared, debated, and considered against each other as travel destinations. Unfortunately, that’s not really fair to either city for one simple reason: despite their close geographic proximity, the fact that the Danube River flows through each, and that they were both very instrumental in the Austro-Hungarian Empire, in most ways, Vienna and Budapest could not be more different. They don’t look the same. They don’t feel the same. And while Budapest and Vienna are both gorgeous European capital cities, they’re each better suited for a different kind of traveler–in other words, people who fall in love with one tend to warm less to the other. Trying to decide whether to visit Budapest or Vienna? Here’s how to decide which city is right for you. Should I Visit Both Vienna and Budapest? There’s no doubt about it: Vienna is pricey, and Budapest is not. 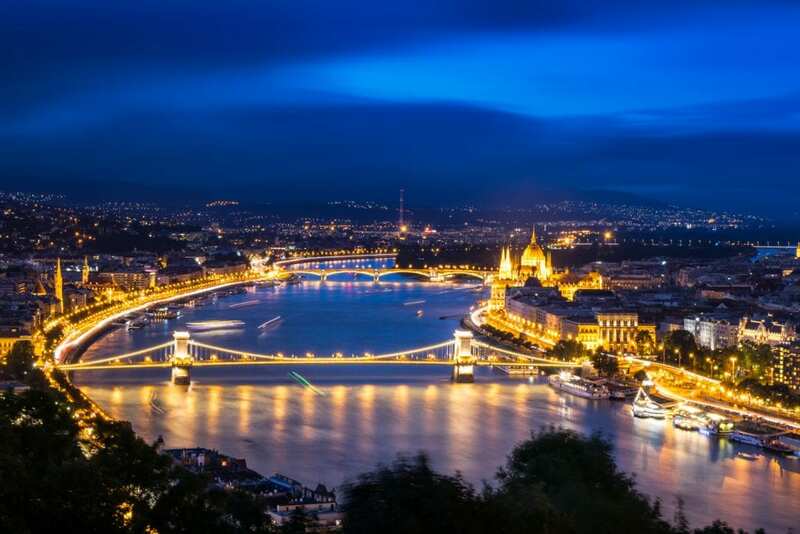 You can expect to pay far less for everything from lodging to restaurant meals to public transportation to tourist attractions in Budapest vs Vienna, making a city break almost universally less expensive in Budapest. 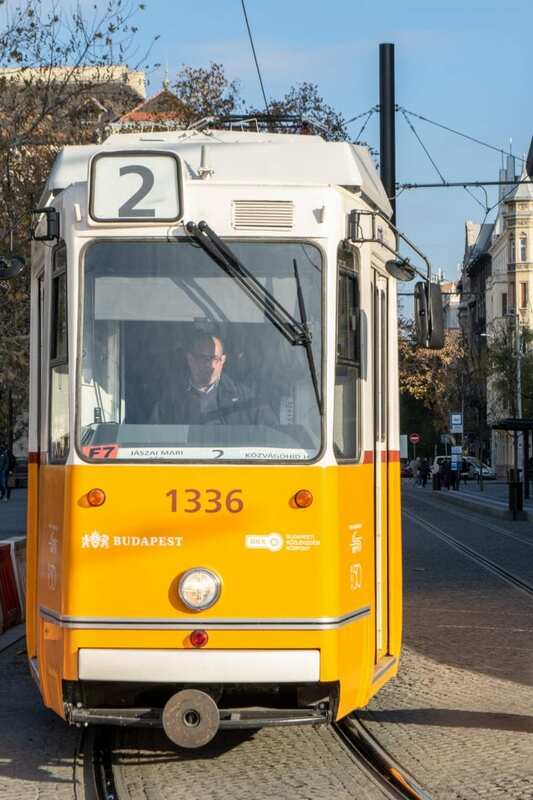 For example, as of the time of writing, a single ticket on the Budapest public transportation system is about $1.25 USD. In Vienna, it’s around $2.75, which is on par with New York City! Yes, Vienna’s public transportation system is a bit cleaner, shinier, and newer… but it comes with a hefty fee. … take in epic views of the Danube. The Danube cuts beautifully through Budapest, and some of Budapest’s most beautiful structures–including the famed Hungarian Parliament–hug the river, with even more highlights like Buda Castle, Fisherman’s Bastion, St. Stephen’s Basilica, and more visible from it. 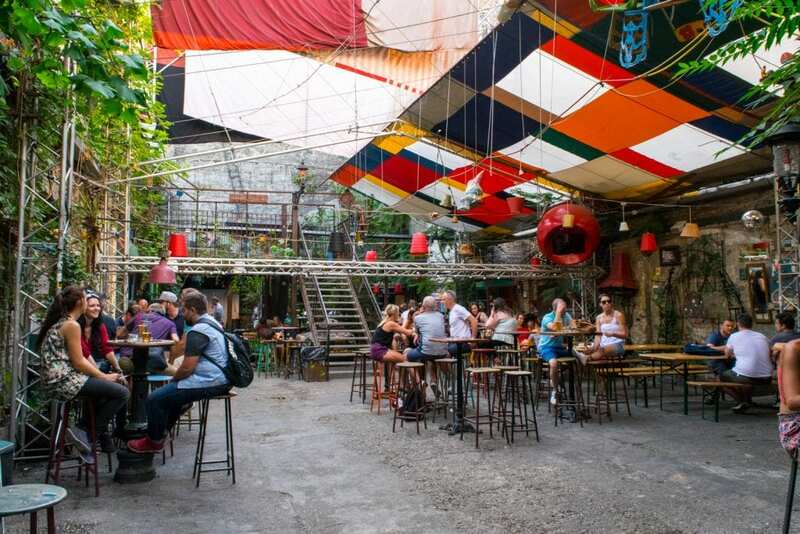 Budapest’s ruin bars are legendary for those looking for a party or pub crawl: crafted out of derelict buildings primarily in the Jewish Quarter (this is where you can find the first and biggest ruin pub, Szimpla Kert),over the last nearly 20 years, the ruin bars have become a unique and popular feature of Budapest. … soak in the thermal baths. Budapest’s thermal baths are an unusual feature in a European city, a leftover influence from the Ottoman age–and they are delightful. 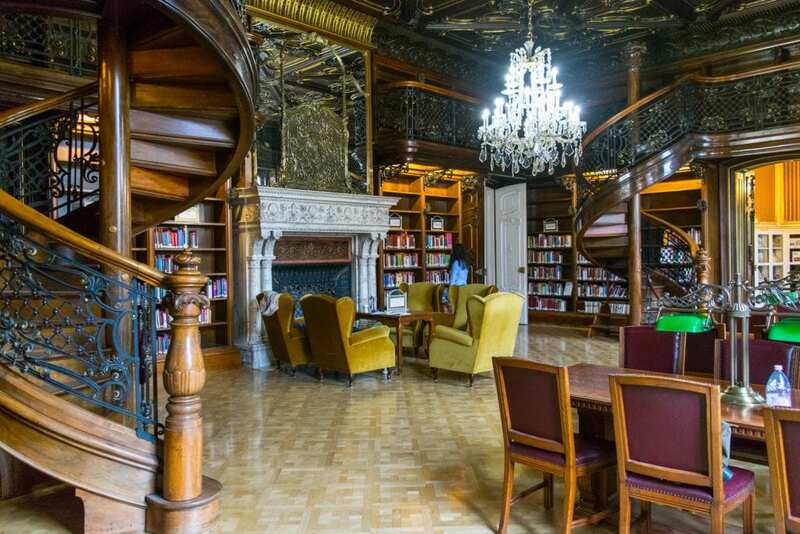 Whether you choose to take a soak in the popular and photogenic Szechenyi Baths, in the gilded and Great-Gatsby-esque Gellert Baths, or seek a little peace and quiet at some of the more offbeat options (we hear good things about the Rudas Baths), you certainly won’t regret an afternoon whiled away at the unique spas of Budapest. … take in views of a more striking cityscape. When it comes to just straight-up staring at (and photographing) the cityscape, the Budapest vs Vienna contest is clear: Budapest wins, hands down. While Vienna is a beautiful and regal city, from above, it tends to appear quite modern and is set against a flat setting that doesn’t add a lot of texture. Budapest, with its large amounts of Art Deco architecture, the hills of Buda, and so many of its iconic structures conveniently situated within view of each other and the Danube (especially when observed from the top of Gellert Hill! ), offers a much more striking view. … learn about the history of the Habsburgs. As one of the most influential royal families in Europe for hundreds of years, the Habsburgs ruled over various forms of their empire (the Holy Roman Empire, the Austrian Empire, and later the Austro-Hungarian Empire) from the 16th century all the way until the 20th–and they did so almost exclusively from Vienna. While that’s simplifying history a bit (needless to say, it got complicated in the way that family trees with a tendency toward mental instability and whose members competed with each other for intense power and money do), the bottom line is that the history of the Habsburgs has made Vienna a hotbed of European history. Imperial palaces dot the city, and it’s hard to imagine a better city to do a deep dive into Central European history than in Vienna. … to tour world-class museums. 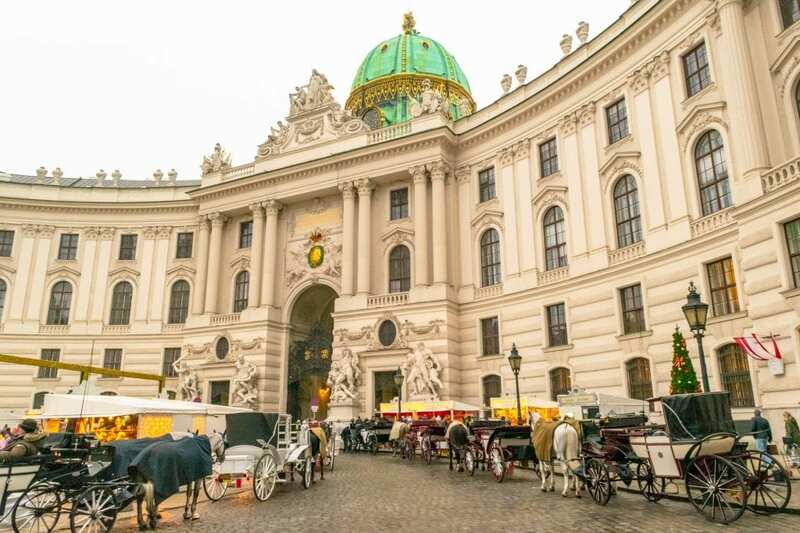 With the power, money, and prestige of the Habsburgs, countless valuable world treasures made their way to Vienna over the centuries… and most of them are still there. 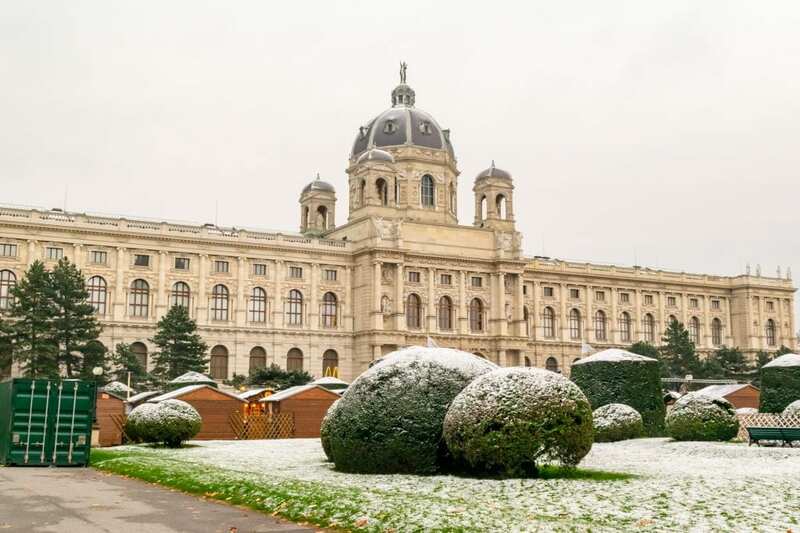 If museums are a big focus of your trip, Vienna is the right city for you: from gems like the Natural History Museum and Museum of Applied Arts to, of course, the royal palaces themselves, there is no shortage of impressive museums in Vienna. … sip amazing hot chocolate. 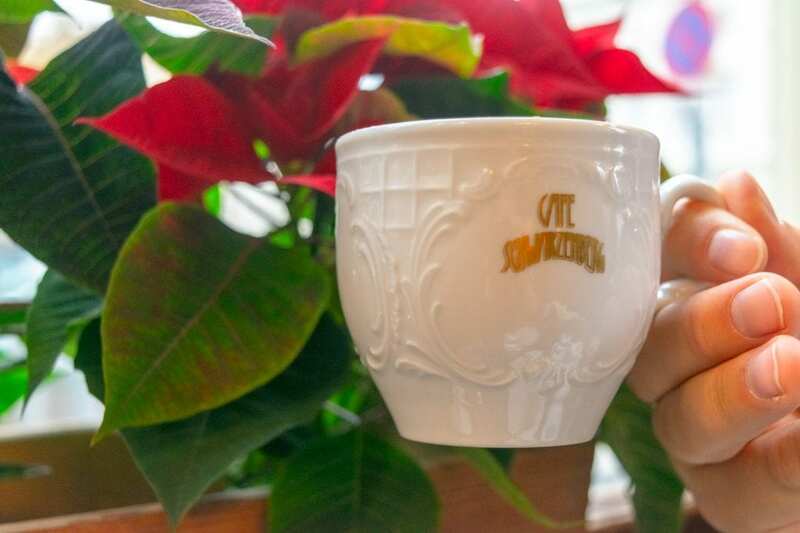 Viennese hot chocolate is a magical, magical thing. … visit some of the best Christmas markets in the world. If you’re planning a trip to Budapest or Vienna in December, Vienna is definitely the right choice. While most cities in Europe have gotten in on the Christmas market tradition these days, Germany and Austria are still home to some of the best in the world–and Vienna’s Christmas markets are among the best of the best! 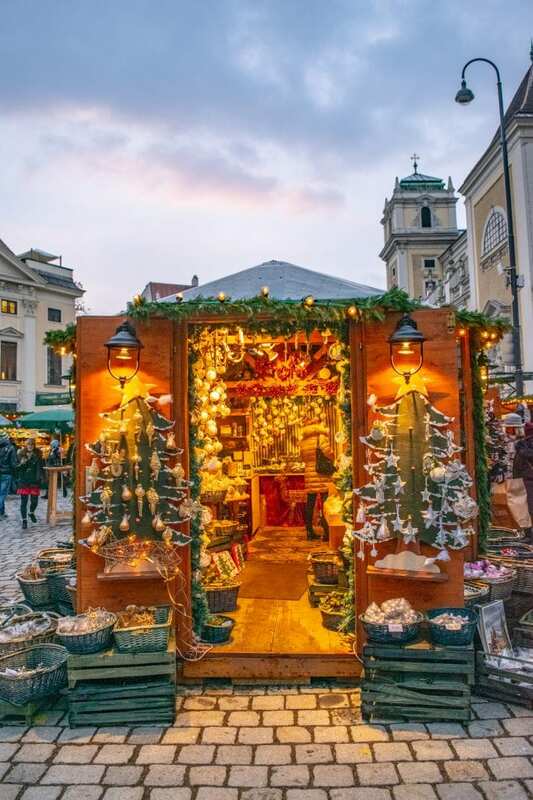 With more than a dozen Christmas markets dotting the city, there’s a Christmas market in Vienna for every taste, from the traditional to the modern, from the food-focused to the craft-focused. Also: if you visit Vienna in December, don’t miss the incredible ice skating course (rink is too simple of a word for it) in front of Rathausplatz! … opera and/or classical music is an interest of yours. Vienna’s music culture is almost unparalleled: as the home of Mozart, Beethoven, and many others, Vienna’s appreciation of classical music continues to this day, and there’s no better city in which to take in a performance. … experience an incredibly orderly, clean city. Like virtually everywhere we’ve visited in Germany and Austria, Vienna is incredibly clean. The metros are clean, the buildings are clean, the streets are clean–so much so that the city can sometimes feel almost sterile! 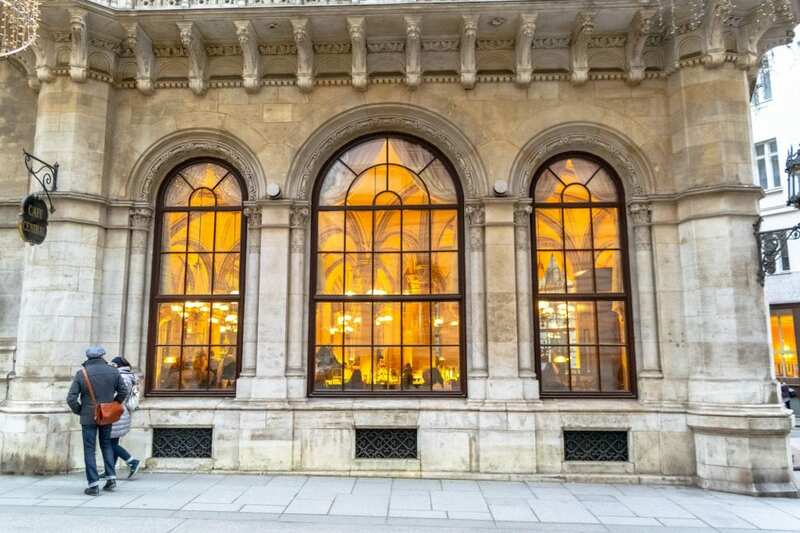 For some travelers, this is an enormous advantage, and to some, it’s a bit of a surreal experience–but if you’re looking for somewhere that is incredibly orderly, where the rules are many and everyone follows them to the letter, you’ll find it in Vienna. 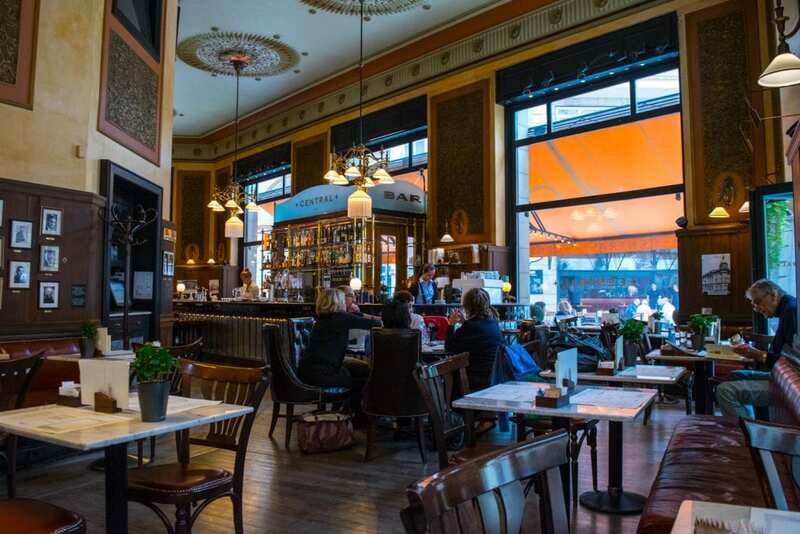 Thanks to the shared history of the Austro-Hungarian Empire, Budapest and Vienna share a love of gilded, glitzy, glamorous cafes. Whether you travel to Vienna or Budapest, be sure to visit at least a couple to sip a hot drink and to try a slice of tasty Esterhazy cake. … their central location in Europe. By train, bus, and plane, both Budapest and Vienna are well-connected to the rest of Europe and are easy to work into a multi-destination European itinerary (which is often how the question of Budapest or Vienna pops up in the first place!). … to see St. Stephen’s Basilica. Yes, both Vienna and Budapest have a gorgeous cathedral named St. Stephen’s Basilica, and both feature a tower you can head to the top of to enjoy views of the city! Unsurprisingly, both are stunning and worth visiting. Absolutely, if you have the time! However, I would say that Budapest and Vienna each require a minimum of 2 days to experience properly, and really more like 3-4 to start doing them justice. If you have less than 5 full days to work with (2 in each city and one to travel between them), I would strongly recommend picking either Budapest or Vienna. Though the fast trains make it possible to visit Vienna or Budapest as a (long) day trip from the other, we wouldn’t recommend it: neither city is easy to see in one day, and both have major sights that are located far apart from each other. Ultimately to decide whether Vienna or Budapest is right for you, the most important question to ask is what kind of trip you are looking for. If you’re looking for a regal and beautiful city that offers incredible museums and well-preserved history, Vienna is the city for you. 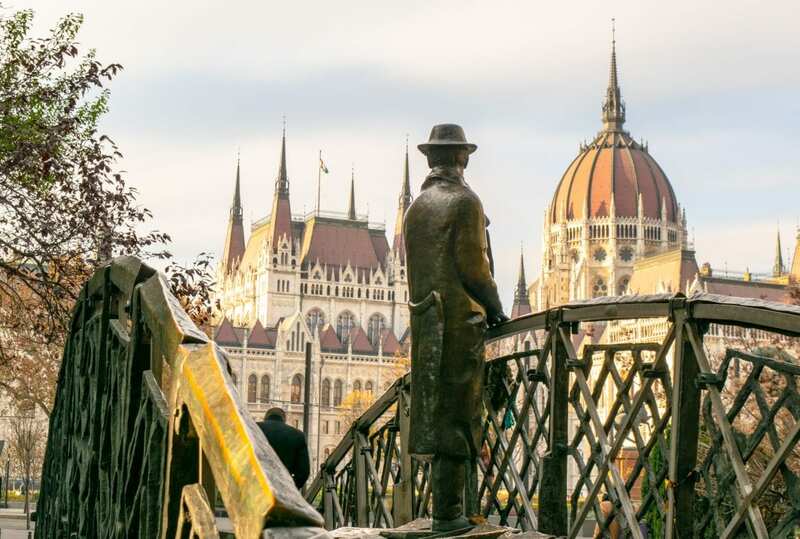 If you’re looking to spend more of your trip walking around to different attractions, taking in viewpoints, and exploring neighborhoods, then head directly to Budapest!